I've got a tool-chain fo sorts here, so I can switch things up quickly. spritefont in one tool, maps in another. Everything linked. It's just the code logic that needs the real work, plus the ideas. Didn't you used to used Blitz a while back? I would be lying if I said the concept was all mine! But it was a very quick turn-around from start to finish (5 weeks from start to finish). I was pleased when the sound all came together as that was a lot of work writing all the new sound system. It's written in a custom version of Monkey2 (called MX2). This is a version of BASIC. 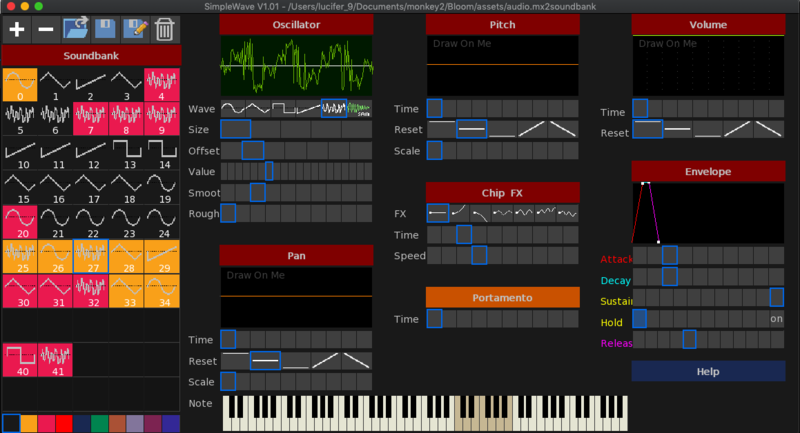 The audio is a custom written system called QasarBeach, which provides all audio, synth and sequencer functions. In essence it is configured as a 16 voice synth with samples, wavetables, modulation etc. QasarBeach has full sequencing features, so it was a case of getting the right sounds (single sound for 48k, 3 sounds + noise for 128k, and 8 sounds for Next) These all reside together and depending on the spectrum type, sounds are muted and not played. The graphics were done in FontSprite using a ZX-Spectrum palette. This gives 256 ''characters' to play with. There are multiple fonts being used with the general character size being 16x16 pixels. The map is created in FontMap. And uses multiple layers to create the map and item locations. There are read in and partly randomised so that each game has different locations for items. its compiled on linux mint - you will need sdl and openal and opengl installed. what MacOS are you using - can you see anything?? Just to say I'm really impressed with this. Great work. Created to replicate the Sinclair ZX-Spectrum both in look and feel but also sound using a custom sound engine QasarBeach. You are Mortis: Overworked minion of Mr De'Ath. His runes have been nicked and it's up to you to find them against the clock and hampered by meanies all in a retro isometric map. First there was SaberWulf, then there was KnightLore - now there is VivaMortis! brilliant that you got it working, and the information about the greyscale crash is great to hear - I can work on a fix for that for you. I can also look at supporting direct name png which will internally convert to the correct sizes. FontSprite supports png files with a certain name format. It's still around, but a bit long in the tooth. Both assets for 'BloodCrypt' and 'SacredLands' were created with it. Currently it needs to be completely updated (rewritten), but I have some OpenGL issues this end, so decided to pull it completely. Are you interested or need access to Rameses? 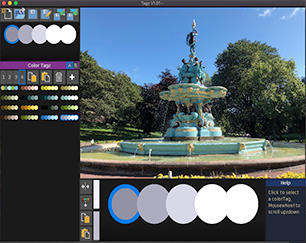 ColorTagz is a fun color palette/theme app, that allows you to create color palettes from images. Just open an image or drop one from your desktop and pick the colors. You can copy and paste color and Tagz and save the results. The file format is provided along with monkey2 (basic like) source code for loading ColorTagz into your own apps. Version 1.03 is now available that addresses the detailed issues below. Great to know you liked it and also the comments. I'll do my best to address them for you. There is also a custom song editor that eats the created chip-sounds, to make the tunes. A Lot of the technology was developed doing this and sound needs to be sorted. Hi Xerra. Once again thanks for the bug hunting. New update 1.02 addresses the keyboard issues and hopefully the getting stuck on ladders. Question about the getting stuck. were you on the top level or the middle level, or both when it happened?